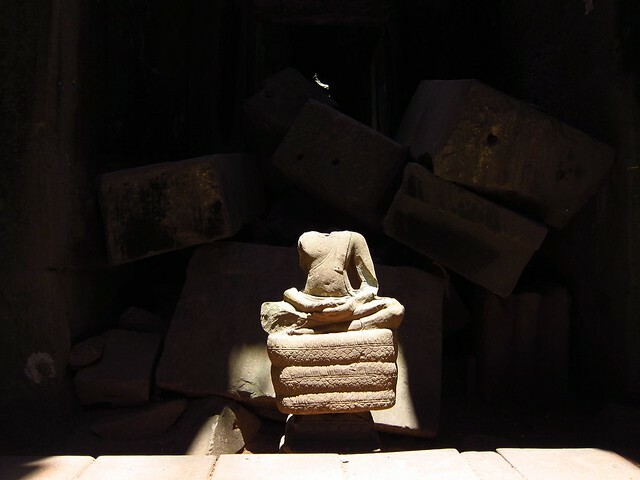 You're viewing a category page for Cambodia. 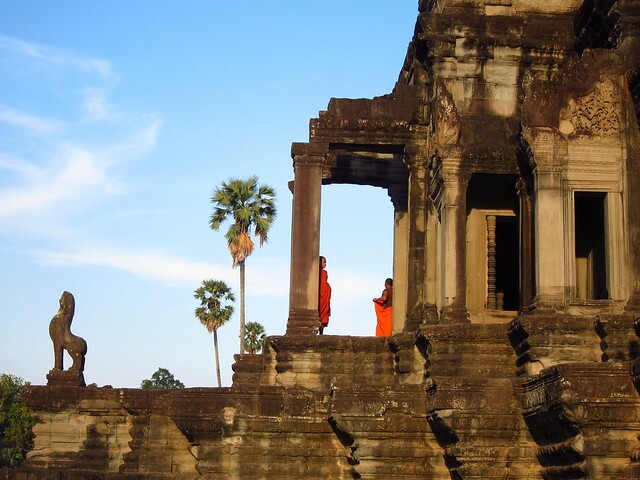 Maybe you'd also be interested in our pictures from Cambodia, or our experiences with money or visas in Cambodia? 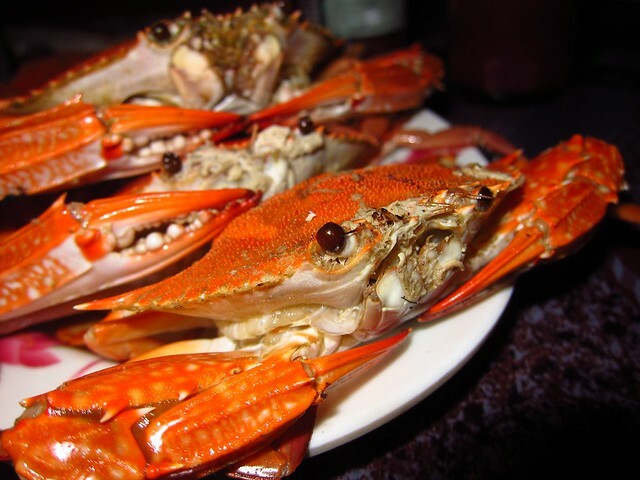 Back home in Washington DC, one of our favorite summertime treats is to head toward the Chesapeake Bay and spend a day eating Maryland blue crabs until our stomachs are stuffed. 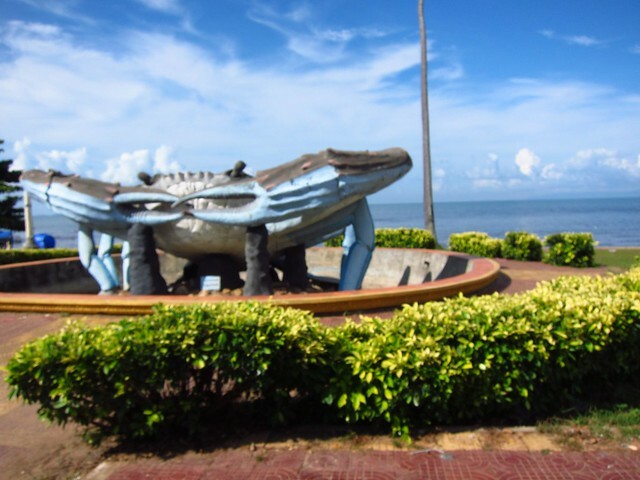 So when we learned that there was a city called Kep on the eastern end of Cambodia's coast whose waters were teeming with crabs, our interest was piqued. Throw in some world-class pepper from neighboring Kampot, and the deserted beaches of Rabbit Island just minutes off the coast, and our fate was sealed. Off to Kep! Crabs-wise, we weren't disappointed. The crabs themselves were about the same size as the Chesapeake ones, and the meat was just as tender and delicious, but the shells were the big difference, being much thinner and softer than we're used to, enabling us to crack them open with our teeth (the minor dental problems Claudia is having didn't even deter her!). I think we had six servings of crab in three days, in nearly every possible preparation: steamed crabs, grilled crabs, crab curry, tiny deep-fried crabs served as a beer snack...but the best was the simple preparation in a spicy, syrupy sauce featuring fresh green peppercorns still on the stem. And the pepper itself was a revelation. We didn't realize we'd been eating only average ground pepper our whole lives until we tried something a step up; fresh, flavorful, and spicy, it's good enough to eat on its own. We had many dinners in Cambodia made up of nothing more than meat or seafood with a dipping sauce made from fresh lime juice, ground black peppercorns, and a pinch of salt. 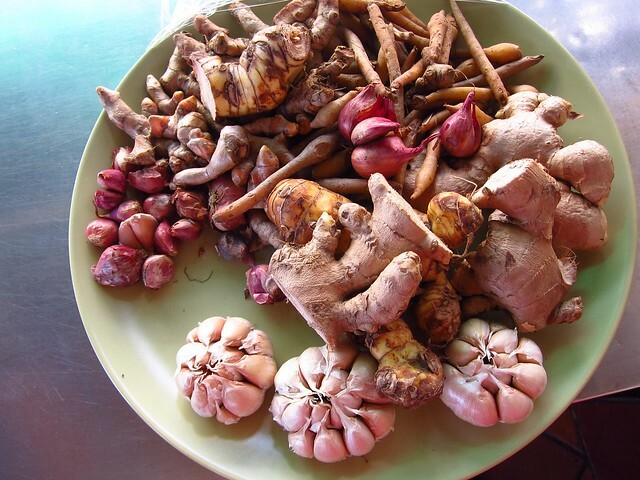 When we visited Kampot we picked up a kilo of the delicious spice so everyone back home can try it too! Our last afternoon in town, finally able to tear ourselves away from the oceanside crab shacks, we borrowed mountain bikes to tour the city's vast expanse of crumbling French villas. 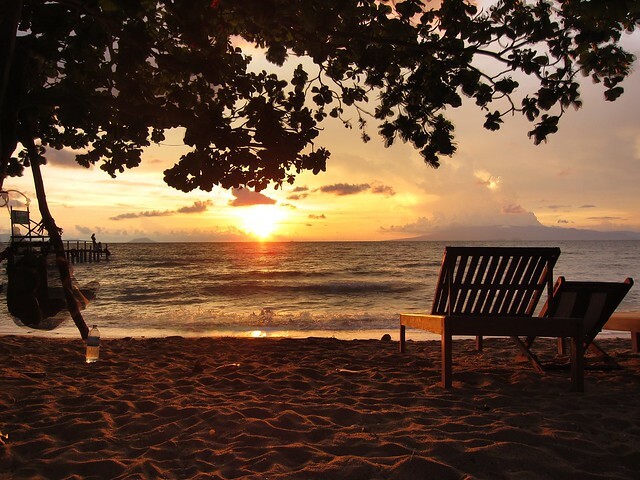 During the last years of French colonization of Cambodia, Kep (or, as it was known then, Kep-sur-Mer) was the seaside destination for the French upper class. In the 1950s and 60s, it was billed as a top vacation destination, and saw a huge upsurge in construction. 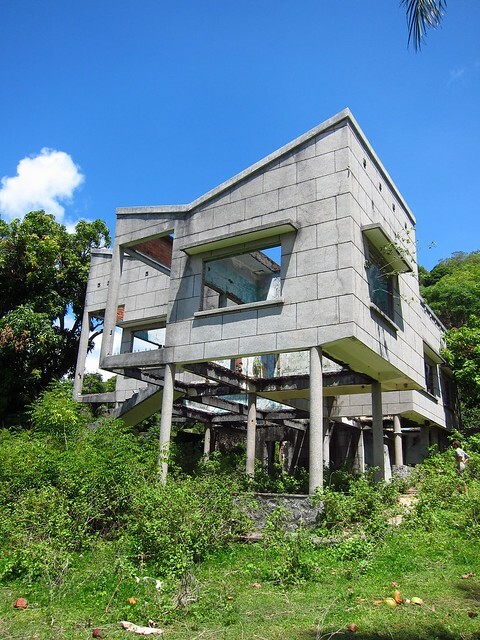 As the country fell into civil war in the late 60s, however, the villas were abandoned seemingly overnight. The intervening decades have seen roofs and floors crumbling, and vegetation growing unchecked. What's a loss for a few wealthy French families is our gain, as we spent a few hours wandering through the modern ruins, trying to imagine the city at the height of its decadence, and wishing we had the money, time, and construction knowledge to refurbish one of these midcentury masterpieces. Who Wants to Chip In With Us on this Beauty? Our last diversion away from Kep was an overnight stay on nearby Rabbit Island. As all good island stays should be, ours featured nothing of note more than copious hammock time, fresh seafood, and a stay in a sub-ten-dollar bamboo bungalow. Life doesn't get much better! 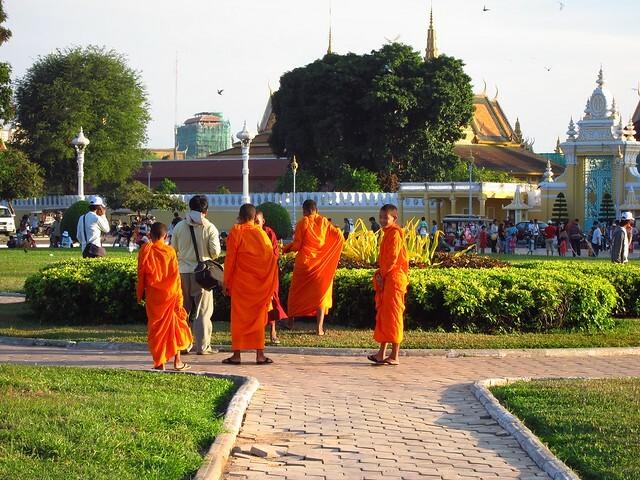 We found Phnom Penh to be a charmer: tons of wide and clean green spaces, precisely executed temples, palaces, and monuments (none of which we toured! ), a pretty riverfront, eco-friendly boutiques, and tons of restaurants, cafes, and bars to satisfy a wide range of tastes. We cannot emphasize how clean the sidewalks and parks were; we're convinced the city tries to keep unemployment down by hiring an excessive number of street-cleaners. 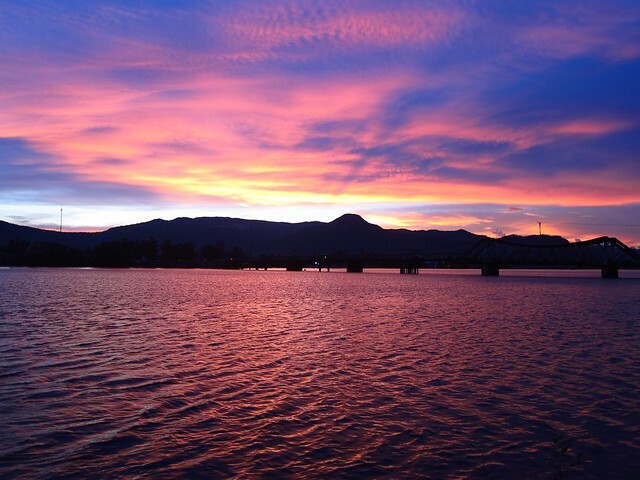 But this beautiful city, like the rest of the country, has an ugly past. 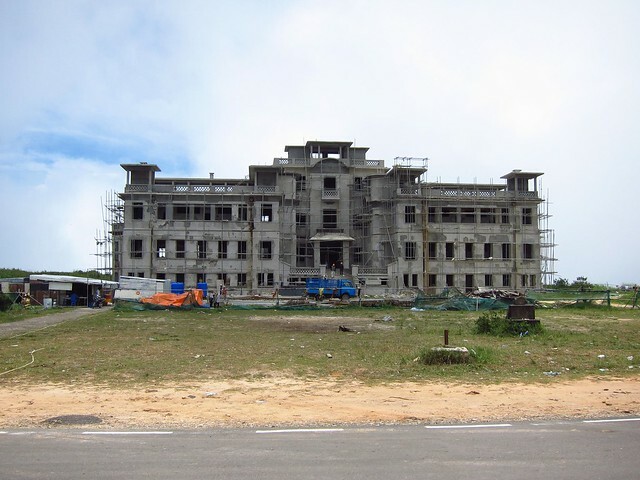 A year ago, we knew little of Cambodia. But as our arrival to this country approached, we read up on its brutal history and watched The Killing Fields to learn more about the genocide that occurred here in the 1970s. From 1970 to 1975, the country was in civil war, but in 1975, the revolutionary Khmer Rouge won the war, and were greeted as heroes and liberators as they entered Phnom Penh. 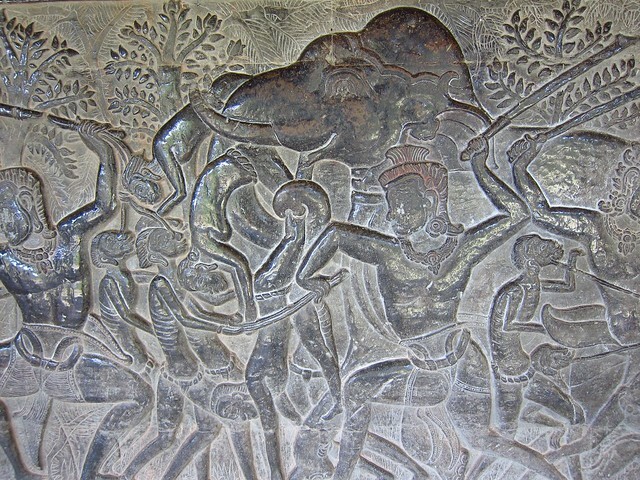 Soon after, the Cambodian people realized just who was now in charge. The Khmer Rouge, led by Pol Pot, wanted to create an agrarian peasant society, entirely independent of other countries for its survival. Anyone who was educated and therefore feared as a threat to the regime was suspected of being a traitor, including doctors, lawyers, professors, and former government employees. City-dwellers were driven from their homes en masse and sent to labor camps in the country where men, women, and children were forced to work hellishly long days on the rice fields and fed one or two meager meals of thin porridge per day. Everyone was given the same haircut, the same clothes to wear. Individuality was forbidden, families were broken apart, and kids were often sent to child labor or soldier training camps away from their parents. The weak and sick were regarded as useless to the regime and were disposed of accordingly. There was no medicine or real medical care, and many died from starvation, dehydration, or dysentary. It is estimated that 1.5-2 million people, or 1/4 to 1/3 of the entire population, died during the 44-month period-- from hunger, sickness, or outright murdered by the regime. This brutal period came to an end in 1978 when the Vietnamese army invaded in response to the Khmer Rouge overstepping their borders. 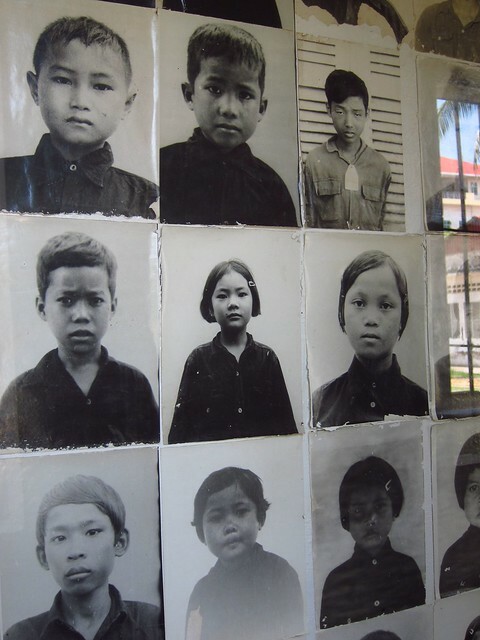 During our stay in Phnom Penh, other than the usual walking around, hitting the market, and sampling the local food, we visited two very insightful and moving places: the Tuol Sleng prison and the Killing Fields. 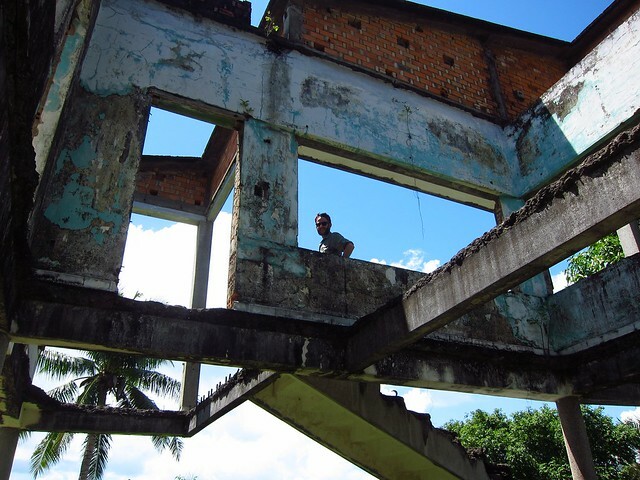 The former, also called S-21, is a school-turned-prison where the Pol Pot regime kept and tortured thousands of political prisoners. The exhibits are simple and haunting. Walking in and out of the small rooms, each formerly a classroom and later a prison cell, you see the torture devices used, the tiny cells where prisoners were kept, and exhibits showing hundreds of photographs of prisoners (mug shots and documentation of torture). When the prison officials were ready to kill their prisoners, they sent them off to one of the dozens of "killing fields" around the country. 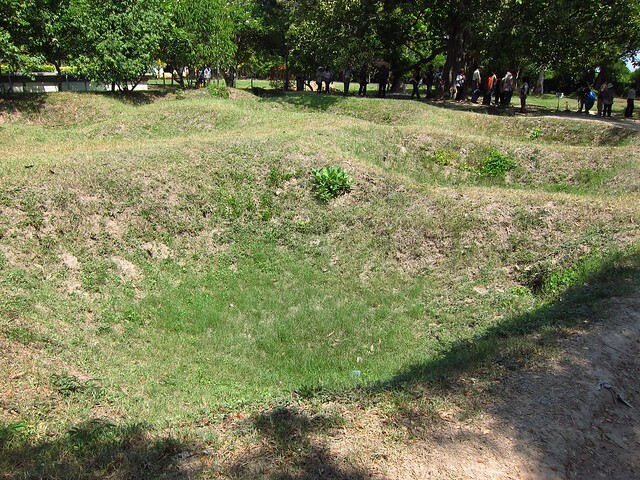 Most of the S-21 prisoners were sent to be killed at Choeung Ek, about 15 km from the city center. Today, this area has been turned into a memorial, with a huge skull- and bone-filled stupa, as well as an incredibly moving and informative audio tour around the area. Where hundreds of bodies once laid in piles, there are now depressions in the ground where bone fragments resurface during particularly heavy rainfall. 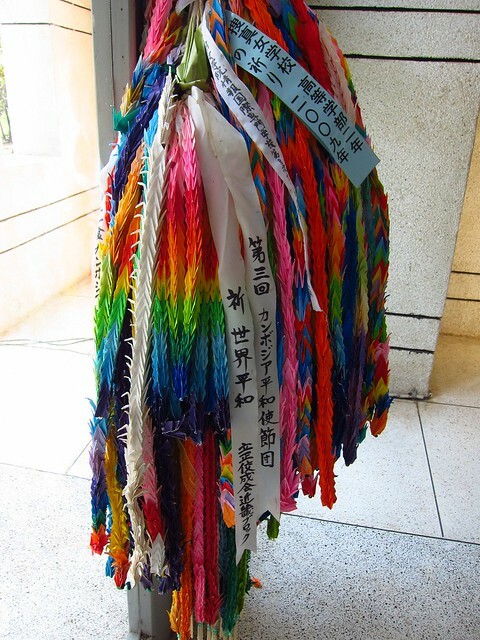 There are displays holding piles of the executed prisoners' clothing. The regime was so brutal that in order to save precious bullets, they bludgeoned their victims to death with whatever types of weapons they happened to have-- axes, sticks, hammers. 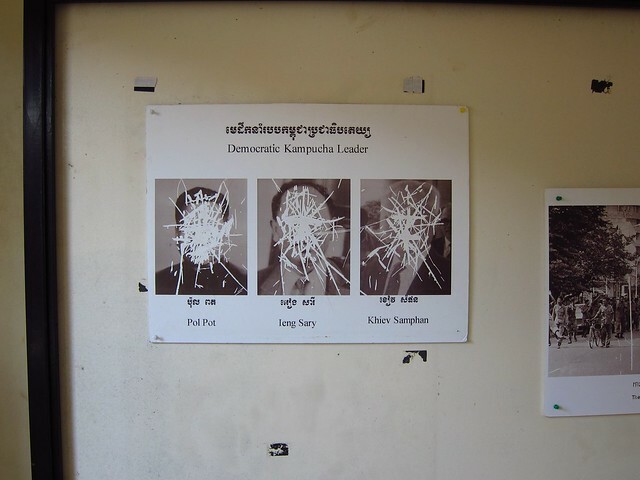 There are also exhibits about the leaders of the Khmer Rouge and their ongoing legal trials, which only started in 2007 and will probably not end before they die of natural causes, given their ages. It is unthinkable that this kind of mass genocide occurred so recently, and it was a stark awakening to learn of the horrific events that we knew little of before visiting Cambodia. 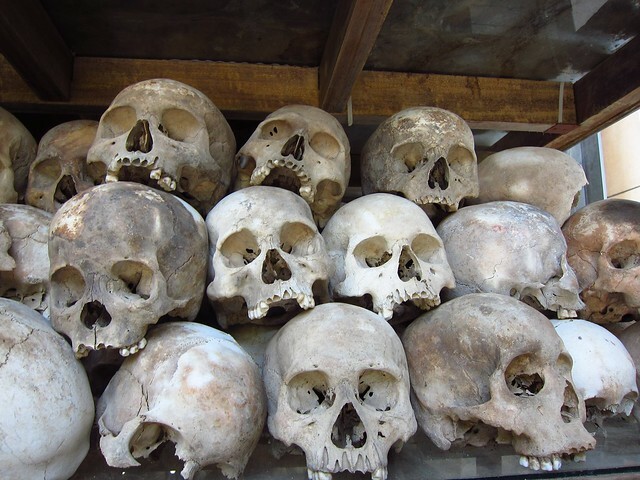 How could the Khmer Rouge be willing to kill millions of their countrymen in order to establish the type of society they believed in, and how could they think that it was worth the devastating effect on the country's people? Learning about this part of Cambodian history filled us with awe at how far the Khmer people have come in rebuilding their country, their society, and their families. If you're interested in learning more about this part of Cambodian history, we recommend watching The Killing Fields, a movie based the true story of an American and a Cambodian journalist during this time, and the autobiography First They Killed My Father, a Cambodian woman's moving tale of her family's experience during the Khmer Rouge's reign. This oversized grenade of a fruit is a love/hate affair. 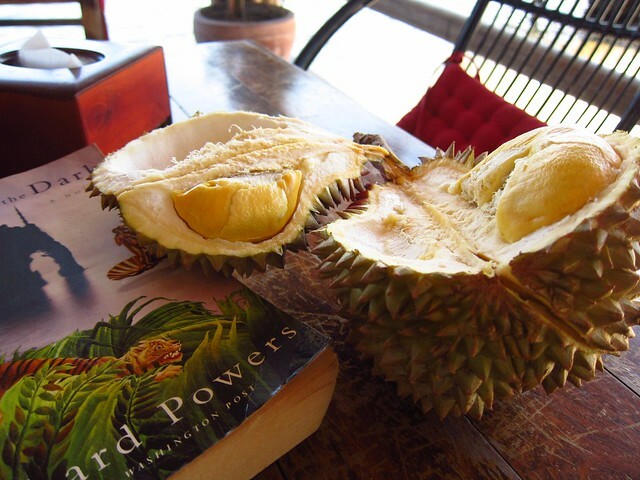 It has a nasty reputation for smelling like trash, but durian fans are willing to overlook its scent's peculiar similarity to dumpster air in order to enjoy the sweet, rich, custard-like meat. Our introduction to the fruit was in ice cream format in Myanmar, where we concluded that it tasted and smelled like onions, and was not exactly the after-lunch sweet treat we were looking for. But we gave it another shot in its unprocessed form and ended up really liking and even craving it. 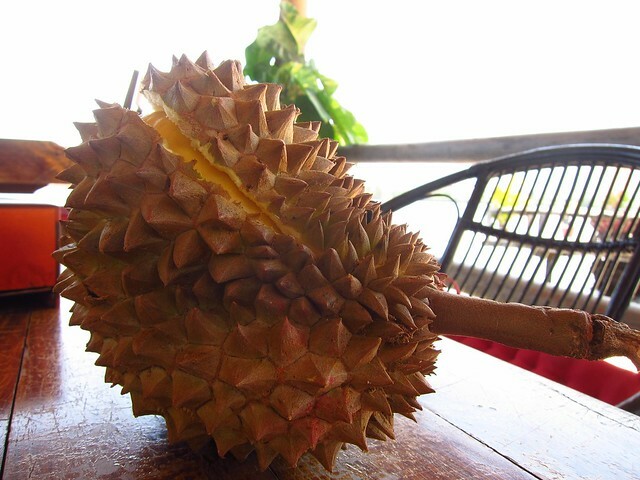 It can be found at most markets where other fruit is sold throughout southeast Asia, and can often be bought in sections since it can be quite a large fruit and has a heftier price tag than most other fruits. The taste is sweet and floral, not unlike the mighty jackfruit, but the consistency is what really got us hooked: it's creamy, almost like souffle or pudding, and the sections are big enough that you can take huge bites of it at once, without pesky skin or pits getting in your way. Just don't leave it in your room like we did once for a few hours...afterward the whole place smelled of restaurant trash! 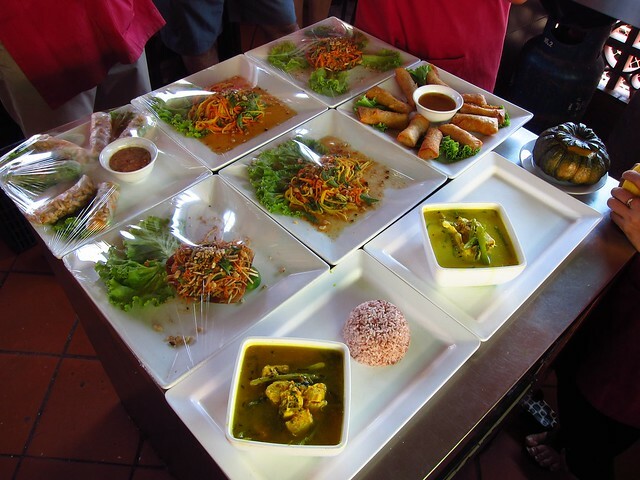 We didn't get the chance to take a cooking class in Thailand due to the craziness of the Songkran celebrations, so we signed up for the next best thing: a Khmer (Cambodian) cooking class in Siem Reap. It was the perfect break from temple-hopping during the middle of the steamy hot day. We weren't sure exactly what Cambodian cooking was, since it was our second full day in the country, but it turns out it is quite similar to Thai cooking, but a bit less spicy. 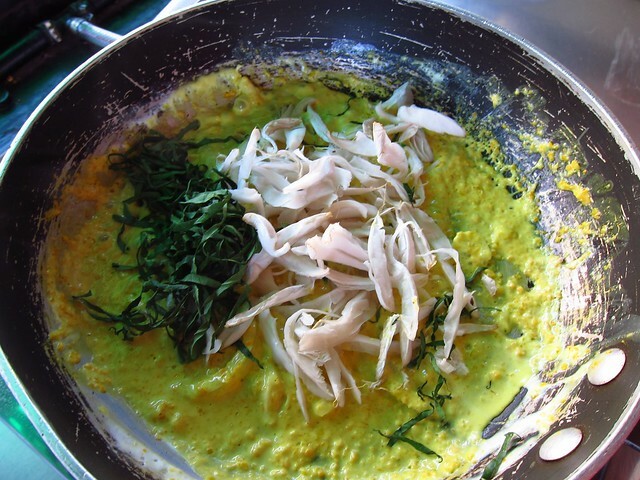 Main ingredients include coconut, lemongrass, coriander, basil, ginger, turmeric, garlic, sugar, lime, fish sauce, and peanuts. We each made an appetizer and a main dish, and then the whole group picked one dessert to cook together. Our day started off with a trip to the market, where I tried not to drip my sweat all over the produce stands (sidenote: Siem Reap has to be the hottest place I've ever been), and then we took to the kitchen and got to it. Our appetizers included fresh spring rolls with pork (one of my favorite apps, and one which I plan to make at home) and banana flower salad. 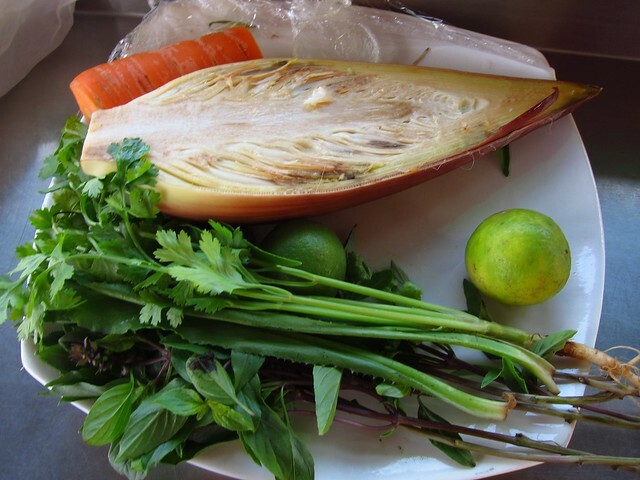 While we probably won't be able to find banana flowers in DC, we wanted to make a typical Khmer salad. Unripened papaya or mango can be used instead of the banana flowers, and unripened tropical fruit shouldn't be too hard to find in DC! 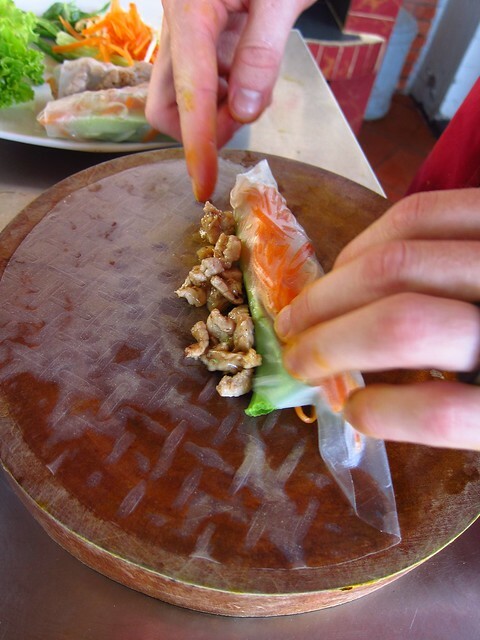 The dressing for the spring rolls and the salad is the same: lime, sugar, cilantro, garlic, shallot, fish sauce, and sweet red chilis (peanuts can be added afterwards). I could drink this stuff by the quart! 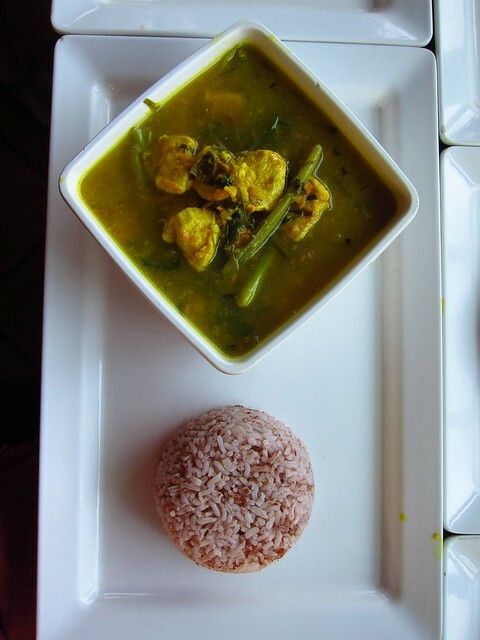 Cambodia's most famous national dish is amok, a coconut-based curry served in a banana leaf cup that can have any kind of meat or seafood in it, but fish amok is the most popular version. We made ours with scallops. The other main dish we made was a sour soup, much like Thailand's tom yum soup, with lemongrass and morning glory. I made mine with chicken. It was incredibly tasty, fresh, tart, and light (there's another version made with coconut milk, but that makes it a heavier affair). For dessert, our teacher showed us how to make pumpkin custard: essentially eggs, coconut milk, cornstarch and sugar beaten together and steamed inside a small pumpkin-- super easy and delicious. After cooking for over two hours, we sat down with our fellow novice chefs and had a feast! We gather all our patience, attention, and--yes--courage for the final push. It's not going to be easy: slogging through the damp and dimly-lit passageways; pulling ourselves up the mountainous formations, the sun beating down hard on our backs. It's like the final three miles of a marathon (or the final three miles of a three-mile run for Claudia). You're probably as sick of hearing about temples as we are about talking about them, but take a deep breath, gather up your remaining fortitude, make sure you're well hydrated, slam a GU, and join us. 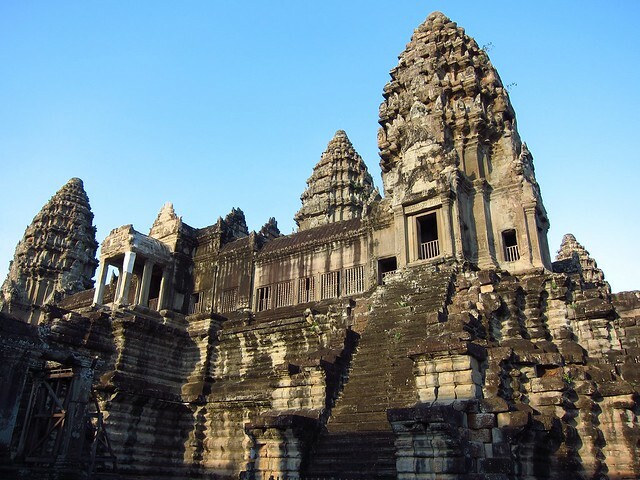 Siem Reap, a large and cosmopolitan city in western Cambodia, is located just a few kilometers away from dozens of pre-medieval ruins, the only evidence left of the powerful and far-reaching Khmer empire of the 9th to 15th centuries. 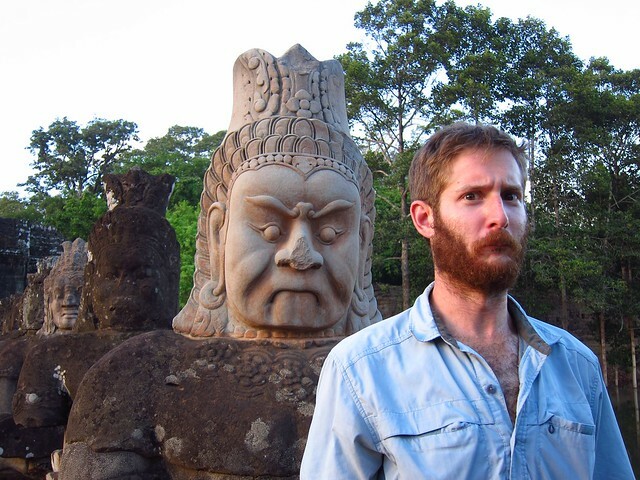 We spent two days biking and tuk-tuking between the historical temples, abodes and worship-places of the god-kings: first the expansive and impressive Angkor Thom; later the beautifully crumbling Ta Prohm, midway through the process of being engulfed by the dense jungle surrounding it; and finally to Angkor Wat, the largest religious building in the world, and an enduring symbol of devotion first to the Hindu deities, and later to the Buddha. Angkor Thom is impressive and almost inconceivably huge. 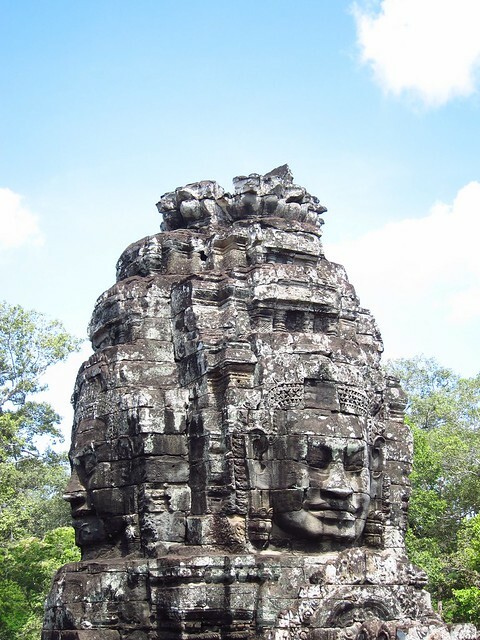 The last complex built by the Khmer kings, it is centered on the impressive Bayon, a monumental structure with numerous four-sided spires brandishing the malevolent faces of Khmer deities. On entering, it seems like a claustrophobic and haphazard jumble of un-unified features, but after doing a lap or two, its symmetry and the architectural prowess of its designers becomes ever more apparent. 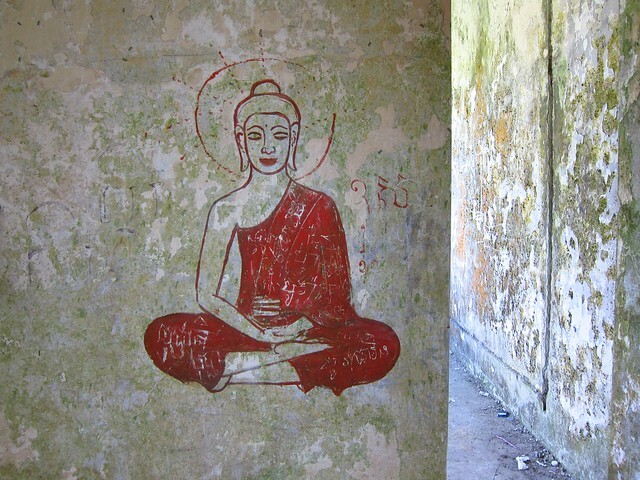 It's easy to wander through the dark tunnels and turn a corner only to unexpectedly come across a small shrine with burning incense and a few worshipping devotees, or to pass through a doorway and look up to find yourself faced with an eight-foot god-head looking none-too-pleased by your presence. Just a bit north stand two regal terraces. 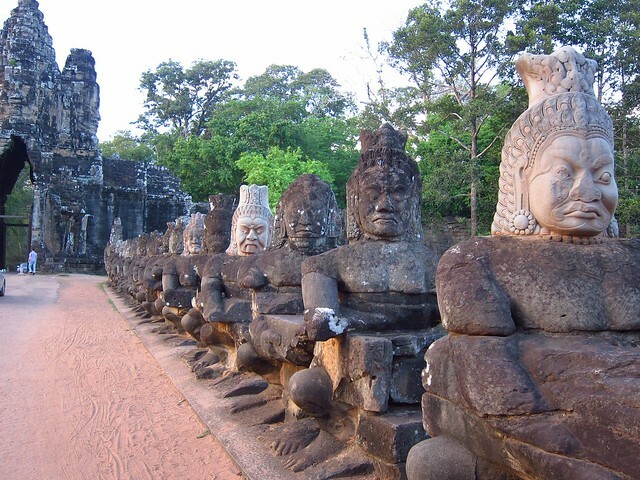 The first and larger terrace of the elephants was used by the Khmer kings to observe processions and sporting demonstrations in the field below. 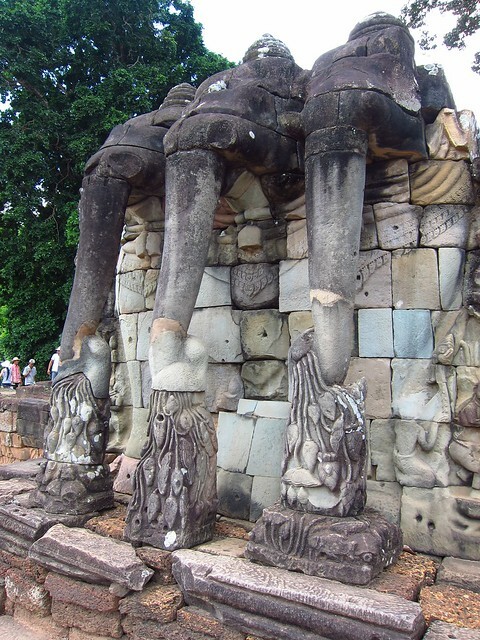 It contains some magnificent stone carving, especially (predictably) of figures of elephants, as well as some stonework that was undoubtedly mis-reconstructed at some point, looking more like a mismatched jumble of kids' blocks or a clumsily solved jigsaw puzzle than the meticulous and deliberate artistic statement that the Khmers were capable of. Surrounding and protecting the whole complex is an expansive moat, only passable through four gateways at the site's sides. Each contains an ominous three-spired archway featuring more god-heads, and a bridge flanked on either side by dozens of muscular representations that we understand to be gods and demons locked in a tug-of-war over the "Churning of the Ocean of Milk", part of a Hindu creation myth. Quite a change from Angkor Thom, instead of the wonders of human devotion and engineering, what's on display here is a somewhat more solemn message of the power of nature and the inevitability of collapse and destruction. Perhaps it was left too long to decay before any serious reconstruction effort was underway, but the trees are clearly in control here, and not the humans. 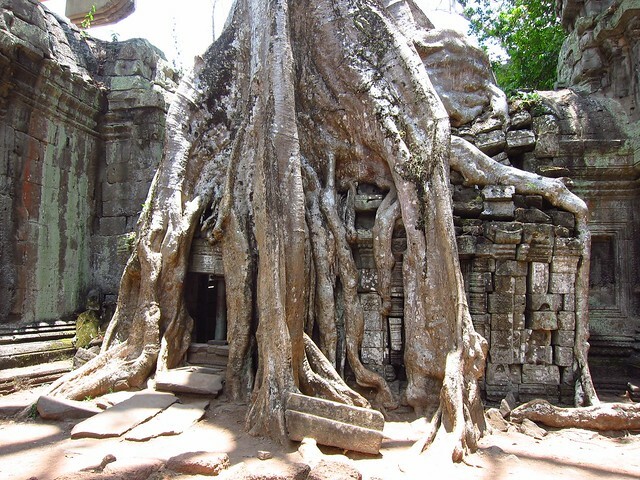 The temple is covered, choked, and strangled with the bulbous roots of tall trees. The root systems climb over spires, straddle walls, and pull individual stone blocks out of place one by one in their endless search for fresh soil. It's a humbling display of the power of nature, and also an experience that leads me to question how much restoration and upkeep have taken place with the other historical structures we've visited: If this is what's possible in less than a thousand years, then how much does the well-intentioned but sometimes mistaken efforts of a few decades of historians, archaeologists, and modern engineers affect our experience of once-momentous structures? 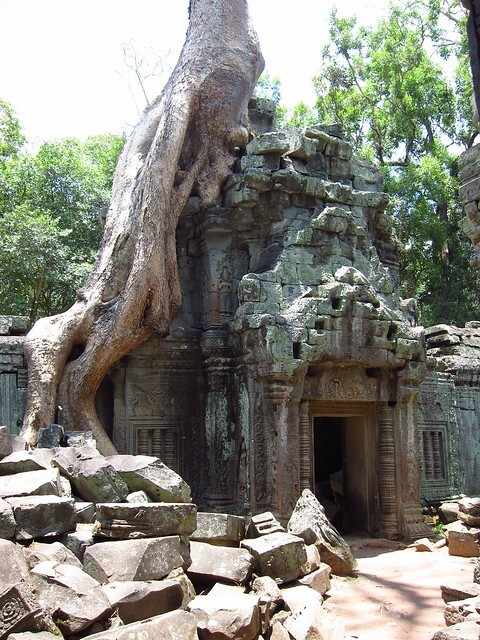 Fun fact: much of the Angelina Jolie vehicle, Tomb Raider, was filmed at this temple. Finally, the best-known and probably most technically impressive structure in the area: Angkor Wat. Massive in scale, the building towers over its surroundings; and yet meticulous in detail, it draws the eye to the hundreds of meters of detailed carvings no more than an arm's reach away. Angkor Wat's scale and symmetry can be deceiving, even disorienting: after making a few laps of the various levels of interconnected terraces, it's hard to tell how high up you are, and where in the expansive floorplan you've ended up. 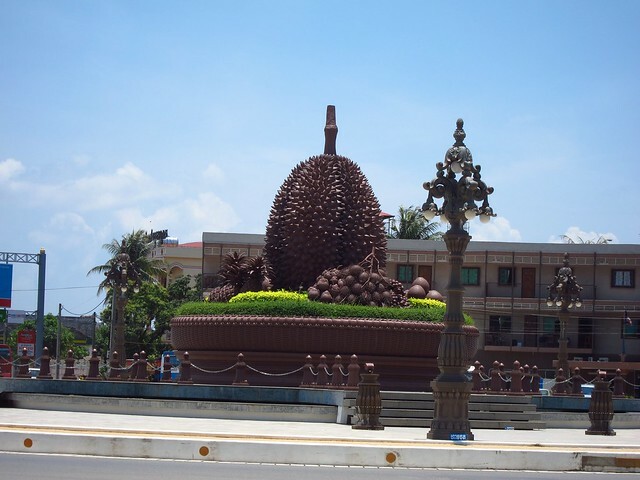 It's the ultimate expression of Khmer engineering, and deserving of all the accolades bestowed upon it. It's one of those places, like the Taj Mahal, or Machu Picchu, that looks impressive and almost impossibly beautiful in photos, and equally as impressive in person.